With an increasing number of people joining the ranks of RV owners, some of the basics need to be passed along to provide safety while travelling. One basic precept is proper tire maintenance and care and another is tire pressure monitoring. I’ll review some of the basics in this article and provide some options for those unsure about how to monitor tire pressure in a subsequent Tech Tip. Tires on RVs are specified based on the maximum weight they can carry in either a single or dual configuration. Each tire requires a specified air pressure to carry the weight of a properly loaded RV. All vehicle manufacturers must place on the vehicle, a Federal Motor Vehicle Safety Standards (FMVSS) label that certifies the vehicle meets the applicable standards as of the date of manufacture. On RVs, the tire pressure shown on the label is the minimum tire air pressure required to allow the RV to carry the weight of the empty RV plus the weight of the "stuff” (people and possessions) up to its maximum payload and vehicle weight capacity (GVWR). This label also specifies the tire pressures required in each axle position to meet the standards. It is located on the driver’s door post for all Class B and C (van style RVs) vehicles and is similar to the one shown in the photo. As an example, the label shown recommends 65 PSI (448 kPa) for the front tires and 80 PSI (552 kPa) for the rear tires to meet the 8,510lb. (3,861kg) GVWR. On most trailers, this label is located on the left front exterior wall near the bottom of the side wall. The label shown recommends 66 PSI (455 kPa) for all tires including the spare tire to meet the 3,980 lb. (1,807kg) GVWR. On larger Class A RVs, the body builder (coach maker) usually places this label low on the interior wall near the driver’s seat. The tire pressure shown on the label should be utilized until the RV is loaded as it will be used, with all the ‘stuff’ to be taken along including people and full fuel, LP (Propane) and water tanks. On the label shown the GVWR is 26,500 lb. (12,020 kg) with the front and rear tires inflated to 105 PSI (724 kPa) tire pressure. Ideally the RV should be weighed as it will be used, preferably on individual wheel scales which measure the actual weight carried at each wheel position. This method provides the most accurate weight information. When this particular RV was weighed as it was loaded, the tire pressures were reduced to 100 PSI (689 kPa) for the front tires and 95 PSI (655 kPa) for the rear. Should the weight of things inside the RV be increased, then the tire pressures should be increased up to the maximum of 105 PSI (724 kPa). Never exceed the GVWR or the maximum tire pressure shown on the tires. If individual weigh scales are not available, then having the RV weighed axle by axle will provide somewhat less accurate but useful information. This method makes the assumption that the weight is evenly distributed side for side, since the measured weight is simply divided by two to determine the weight at each tire position. That may be incorrect: often one side of the RV is heavier than the other since the appliances (as an example) are on that side. A popular place to have a RV weighed is at large truck stops that have a CAT Scale. Once the weight carried on each wheel position or axle is determined, the next step is to consult the tire maker’s tire pressure and specification charts often found on the maker’s website. The weight carrying ability of each tire depends upon whether it is a single tire or as part of a pair of dual tires. Take the weight measured for each tire position and look at the chart for that weight and use the tire pressure that will carry that weight or slightly more. Tire pressure should be the same on both sides of an axle, so use the tire pressure required for the wheel position that is carrying the most weight on both sides of an axle. If the weight was provided for an axle, then divide the axle weight in half and look at the single or dual tire capacity in the charts and use the specified pressure for the next higher weight amount. As an example, if the air pressure specified on a set of dual tires is 80 PSI, then use 85 PSI as the minimum tire pressure on each tire on the axle. All of the tire pressure recommendations are Cold Tire pressures, that is the pressure should be at the recommended pressure before the tire is used. Check the pressure in the morning before heading out for the day. As the ambient temperature increases the pressure will also increase, and vice versa, so the Cold Tire pressure should be checked and adjusted before heading out. While on the topic of checking tire pressure, we can’t over emphasize the importance of an accurate, high quality, tire pressure gauge. Most prefer a dual foot style that can be pushed onto the valve stem of the outer dual tire and single tires and pulled onto the valve stem of the inner dual tire. Of course this assumes that there are no tire valve extensions. The purchase of this gauge is not the time to buy a cheap one. After purchase take the tire gauge to a truck tire shop and see how it compares to their gauge. If it does not match or read very close to the shops, then return it and get another. You need to know that the gauge you are using is reflecting accurate readings. Some prefer electronic gauges however for a number of reasons I’d suggest sticking with a good quality mechanical gauge. While on the topic of tire extensions, many tire shops highly recommend against their use. In most cases a proper valve stem with a solid extension can be installed allowing tire pressure to be read and adjusted and eliminating the risk of an extension working itself loose or being damaged, resulting in instant air loss. Tires on RVs generally do not ‘wear’ out, they ‘age’ out. It is very rare for a RV tire to require replacement because the tread has worn down to where it needs to be replaced, barring any unusual tire alignment issues. Tag axle tires on some RVs are the most likely tires to actual ‘wear out’ since they are dragged when turning and rubber is literally scraped off the tread. 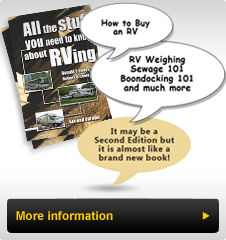 Most RV tires become old and are required to be changed long before the tread wears out. Since the chassis is built prior to the RV body, in most cases, the tires will likely be one to two years older than the RV. This already puts the useful life of the tires at a disadvantage since the tires have already begun to age without any use. The question often asked is: "How do you know how old the tires actually are?” The date of manufacture will be stamped on one side of the tire sidewall. 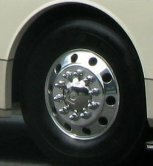 It may not always be visible since that side may have been mounted facing the inside rather than the outside of the RV, especially in dual wheel applications. It will appear as shown in the photo following the letters DOT, a few other letters or numbers and then a ringed area with four numbers known as the date code, such as that shown (3015). The first two digits show the week of the year of manufacture (i.e. 01 to 52) whereas the last two digits show the year the tire was manufactured. Thus the date code for the tire shown in the photo of 3015 indicates that this tire was manufactured the 30thweek of 2015 or July 20th to 26th, 2015. RV tire manufacturers recommend RV specific tires be checked for condition every year with a thorough inspection at a truck tire shop beginning when the tire is five (5) years old. Any cracking or checking in the sidewalls or tread is an indication that the tire is beginning to deteriorate. When a tire is regularly used, it naturally flexes and brings the waxes and carbon in the rubber to the surface to provide protection against UV and Ozone. If the tire sits, not being regularly used, it ‘dries’ out when exposed to these conditions. Newer tires can last up to 10 years although 7 is considered the maximum by many. Any time a tire is underinflated by more than 20%, it is subject to deterioration that dramatically shortens its useful and safe life. It should be removed and inspected, possibly replaced, since damage may have occurred. Always keep RV tires clean, using water and a brush to remove the dirt. Do not use any silicone or tire dressings to make the tire ‘look good’ since these dressings actually promote deterioration. I have found applying 303 Protectant once or twice a year to be one acceptable protectant. I have also eschewed covering the tires, when parked however our RV benefits from being stored inside when not in use. Any time a RV is sitting with tires exposed to the sun for longer periods of time (weeks or months) then covering them to protect them from direct sunlight is a good idea. Ozone will still deteriorate the tires and if the covers attract heat (by being black in color) or wrap around the tire retaining built up heat, then the benefit of covering them may be greatly reduced. Conjecture has it that tires on RVs not subject to intense sun and weather conditions last longer and I would say that the annual inspections are better at determining the tire condition than where it is used. We completed a 10,000 mile (16,000km) round trip to Alberta, British Columbia, Yukon and Alaska on 8-year old tires following the full inspection and recommendation of our tire dealer that the tires were in excellent condition. We carried a spare tire, which we did not need. As the tires were entering their ninth year upon our return home, we replaced them. The ride quality on the original tires was deteriorating giving us a rougher ride than previously. I often refer to older tires as being more ‘plastic like’ not ‘rubber’ to highlight this hardening of the rubber. An example of how the rubber deteriorates with age was demonstrated on a prior RV on which we had decided to buy new tires. The tires were smaller and lighter and I could lift them up quite easily. When the Tire Technician questioned why I was changing tires when they had ‘lots of tread left’, I lifted one of the removed tires to shoulder height with my arms extended and dropped the tire to the ground. It bounced back up about 6” (15cm). I then repeated this with the new tire and it bounced back to within 6” (15cm) of where I had dropped it from. We both quickly understood the benefit of the new tires. Tread life is rarely an issue on RVs, Age is!